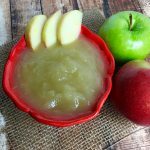 Making fresh applesauce in your Instant Pot is easy and absolutely delicious. And it’s only 2 ingredients! Apples and water! Set on high pressure for only 8 minutes and you’ve got the best applesauce you’ll ever make. One might ask – why go through the trouble of making applesauce when you can buy it for fairly inexpensive prices? Well quite simply, nothing you buy in a jar will ever compare to making it fresh with no added ingredients, chemicals, preservatives, and whatever else you might find in commercial applesauce. With this “recipe” i make this Instant Pot applesauce in small batches. Many recipes call for several pounds of apples and we usually have so much left over. With this recipe, I use only 6 apples – 3 honeycrisp and 3 granny smith. I find that to be the absolute best combination for sweet, tart and savory. Plus, there’s no need to add any sugar! I love the fact that this applesauce recipe uses no added sweetener. Now of course, if you prefer some added sweetness you can always feel free to add some sugar. I suggest adding the sugar 1/2 teaspoon at a time. You can also add some cinnamon for additional goodness. You’ll want to do a quick pressure release after the cooking time, then when the pin drops, remove lid and mash up the apples with a potato masher. Or, if you have picky eaters in the house who like it nice and smooth, use an immersion blender for a minute and it will be perfect. You can mash/blend them to exactly the consistency you like with ease. Finally, transfer your warm applesauce into a bowl and chill in the fridge for an hour. This lets all the flavors of the apples come together and chilled applesauce is much better than warm applesauce. Trust me! I like to store the applesauce in small size plastic Tupperware like containers. Perfect for single servings to bring to school or work. Peel apples and cut into chunks of about 1 inch. Place apple chunks in Instant Pot with 1 cup water. Secure lid, close vent, pressure cook for 8 minutes. Carefully do a quick pressure release. Mash apples or use an immersion blender to desired consistency. Chill before serving.